Great infographics can bring a complex topic to life and give your customers a highly sharable product that they’ll rush to pin, retweet, like, and send. 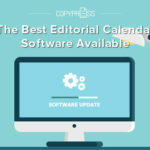 You can create an engaging infographic on nearly any topic, but every project of this type will follow the same general flow from its earliest inception to its final production. These steps will help you create a winning infographic that hits the mark exactly as you hoped it would. 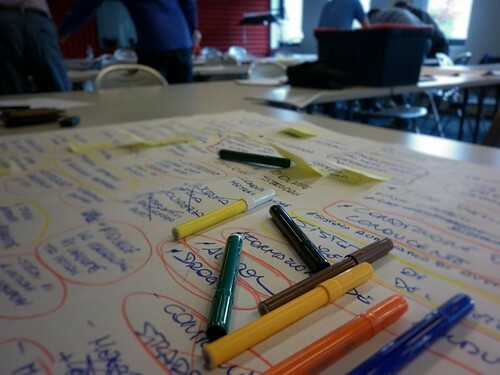 The first step in marketing infographics is ideation. This is the stage where you define your purpose. Are you educating customers on how to use a new a product, establishing thought leadership in a key area, or explaining an important need that your services can fill? Your purpose could be as specific as educating customers about your company’s green business practices or as vague as driving traffic to your blog with a shareable infographic on a trending industry topic. Once you’ve fleshed out the purpose of your project, you can draft a clear ideation. This should include the proposed title for the project, the key question that the graphic will answer, a brief explanation of what type of information will be included, and some solid resources that provide valuable data on the topic. Always check for reliable resources before you proceed too far with your ideation. Some types of data are simply unavailable. Unless you plan to collect the information yourself via a study or survey, you’ll need to avoid topics that don’t have information to back them up. It can help to flesh out a promotional plan for your infographic early. You may quickly realize that your proposed topic isn’t the right fit for your current email newsletter or social media campaign. 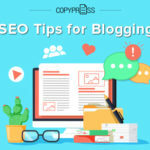 If you’re looking for an infographic to feature in your e-book, you need to make sure it fits the flow of the publication, while an infographic you’re posting on your blog will have more flexibility. Though infographics share many core elements, such as a data-heavy design and eye-catching imagery, they come in many shapes and forms. Identify which story type is the best fit for your topic. If you’re helping your viewers choose the best vacation destination, a flow chart is an effective option. An infographic on your company’s history might follow a timeline format. Other common infographic types include data story, how to, map, comparison, and photo. The story type that you select for your infographic will help your writer frame the data appropriately for the design stage. 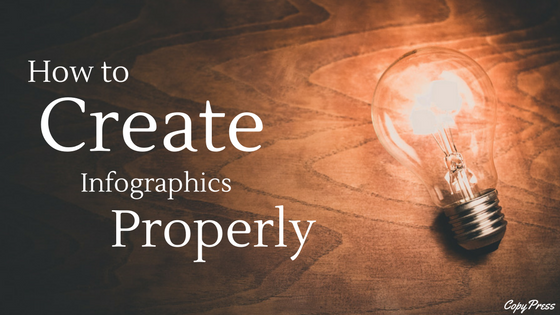 Before you jump into the graphic design stage of your infographic, you need to finalize the writing. Most infographics look somewhat dry at this point, but it’s critical that you take the time to methodically gather data, draft copy, identify subheadings, and determine how you’ll put the information together. 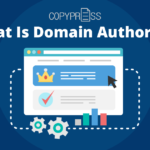 It’s much easier to reorder information, expand upon a topic, or tweak your text in the copy stage than it is at any later point in the development process. You should also proofread your copy and fact check your data carefully at this point. Have a second set of eyes comb through the statistics and make sure everything is represented correctly. Watch for errors in spelling or grammar, as these will typically transfer word-for-word into the wireframe, and on into the finished product. A wireframe is essentially a rough draft for your infographic. This is typically a sparse black and white sketch of how the designer will represent data. It might indicate whether a particular piece of information is depicted as a pie chart or bar graph, but finer details like shading likely aren’t present. The wireframe will give you a good idea of the size and balance that you’ll find in the finished piece. At this stage, you may notice that the infographic seems particularly sparse on the top without enough buildup to balance the data presented at the bottom. You can analyze use and placement of white space, arrangement of text, and the visual path that the data will follow. If your eye gets lost following the flow of the wireframe, you can identify this issue early enough to easily reorder the information and find a more intuitive approach for your information. Before you flesh out the wireframe and design your completed infographic, you should review the key brand elements that will be present in this piece. Are you using the company’s signature typography for headings? What colors scheme will you incorporate? Will images feature a cartoon style or a more realistic appearance? 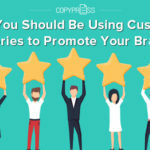 Make sure your infographic features key branding elements that will identify it as an obvious product of your company. Using the right colors and fonts can make the difference between a generic product and one that helps establish your company as an innovative leader in a niche area. Identify key stakeholders who need to be involved in the infographic design process. This is particularly important if you’re hiring a professional content marketing company to create infographics for your business. This is a smart way to access the talents of experienced writers and designers, but it pulls in a larger pool of people, and makes communication critical at every stage. You don’t want to get to the final draft of the infographic only to find out that your marketing director disagrees with the direction of the storyline, or your sales team feels the product representation is off. Encourage your key stakeholders to review and comment on the product at all stages, including ideation, writing, and wireframe. Collaborating throughout the project can help avoid time-consuming edits later. With an organized approach to ideation and production, you can draft a stunning infographic that takes an otherwise complex topic and makes it easily accessible to customers at every skill level. Infographics are a key element in any well-rounded content marketing campaign. Start brainstorming how this type of content can bring important topics to life for your brand. 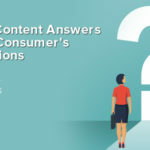 How to Overcome the Top Challenges of Content Marketing What Does the Future Look Like for Content Marketing?